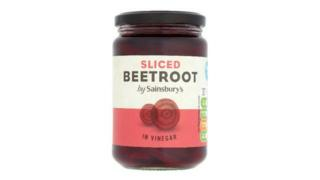 Sainsbury's has recalled one of its beetroot products over fears it may contain small shards of glass. The Food Standards Agency has warned customers who bought a 340g jar of Sainsbury's sliced beetroot - item code 7860491 - not to eat the contents. Sainsbury's has offered refunds to anyone who purchased the product, which can be returned at any branch. The supermarket chain said the move was a "precautionary measure" after glass was found in one batch. An FSA statement read: "The product may contain small pieces of glass which could present a safety risk." Sainsbury's has apologised to its customers for any "inconvenience". A company statement read: "We have identified the possible presence of small pieces of glass in one batch of the above product. "As a precautionary measure, we are asking all customers who have bought this product with the above batch code, not to consume it and to return it to their nearest Sainsbury's store where they will receive a full refund.